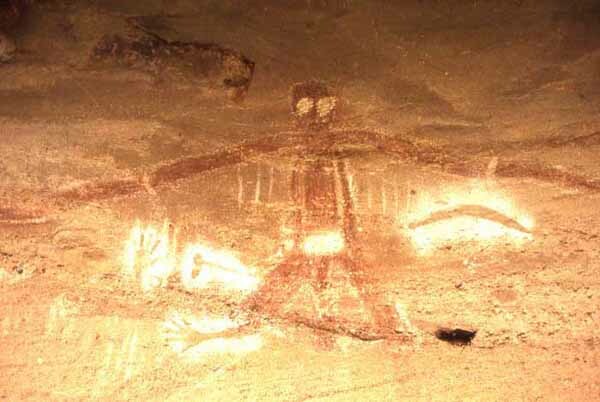 Significant early cave paintings have been found in Kakadu, Australia. 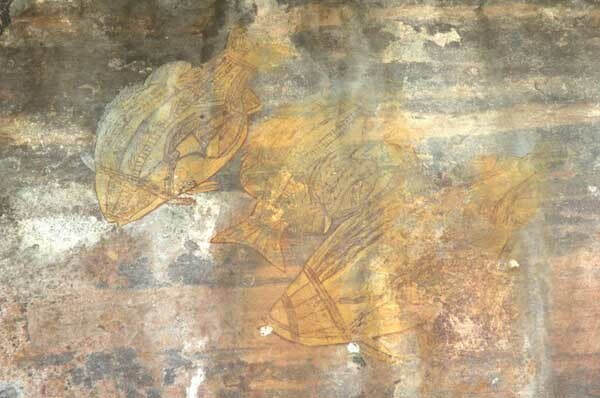 Ochre is a not an organic material, so carbon dating of these pictures is often impossible. Sometimes the approximate date, or at least, an epoch, can be surmised from the painting content, contextual artifacts, or organic material intentionally or inadvertently mixed with the inorganic ochre paint, including torch soot. 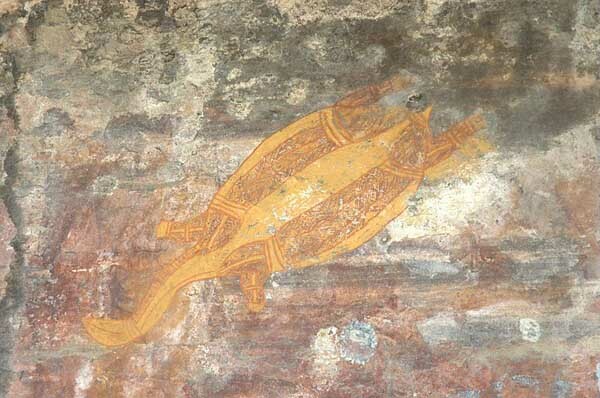 A red ochre painting discovered at the centre of the Arnhem Land plateau about two years ago depicts two emu-like birds with their necks outstretched. They have been identified by a paleontologist as depicting the megafauna species Genyornis. The giant birds were thought to have become extinct more than 40,000 years ago but this may suggest that they existed later than that. The Whitsunday Islands are also home to a surprising number of cave paintings. 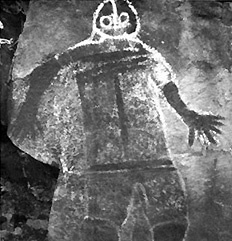 The cave paintings by the sea-faring Ngaro people on Hook Island, Australia, are remarkable for their non-figurative, non-representational, or abstract content. Their significance is a mystery. 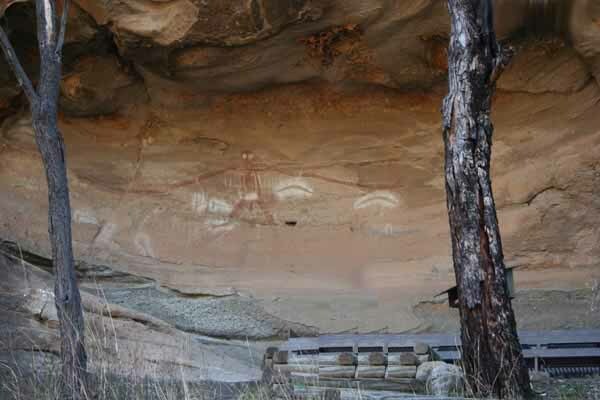 Aboriginal sites of New South Wales consist of a large number of places in the Australian state of New South Wales where it is still possible to see visible signs of the activities and culture of the Australian Aborigines - or Indigenous Australians - who occupied these areas before the arrival of European settlers in 1788. 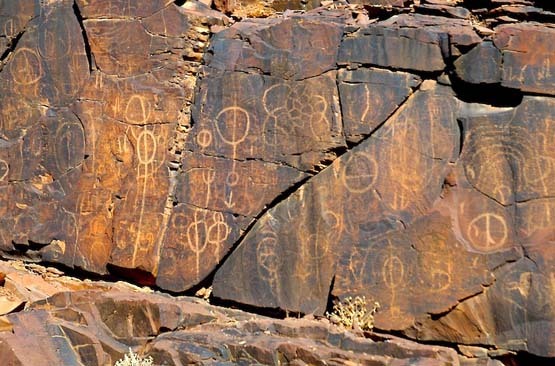 These sites are comparable with the petroglyphs of Native Americans and the Rock Art found elsewhere in Australia, but are not restricted to rock carvings. Many of the sites are on the Register of the National Estate. The Aboriginal Australians arrived in the north of Australia around 50,000 years ago. Sites over 22,000 years old have been found in the Blue Mountains area west of Sydney, while sites going back 40,000 years exist at Lake Mungo. There are some thousands of known sites, many but not all located in national parks. 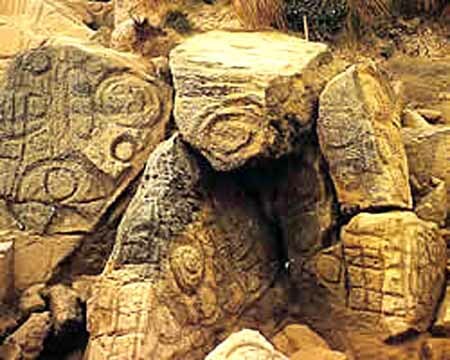 Some sites are also found in more suburban settings; rock carvings can be seen in the Sydney suburbs of Bondi and Tamarama. Indigenous Australians were not interested in "art for art's sake" as understood by Westerners. Art was not something that was separated from daily life and restricted to a gallery. The art they developed was an integral part of day-to-day life and would normally have a purpose. One such purpose is thought to have been what some people call "wish fulfilment magic" - or sympathetic magic - in which the act of creating the magical work is thought to bring about the event depicted in the work. 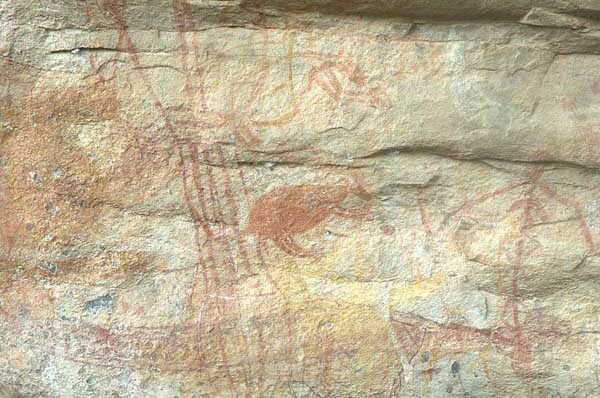 For example, a hunting scene - a common subject in rock carvings - would be aimed at bringing about the desired reality of good hunting. There were also many artworks that were created for specific ceremonial purposes and which were not intended to last after the ceremony was over. In addition to such themes, there were also works of a more secular nature, which could be created for a number of reasons, including the instruction and entertainment of children. There are substantial variations in the character of art developed in different parts of New South Wales. Art in the western part of the state could be very different from the art created in coastal areas. An Aboriginal leader in Australia claims archaeologists have discovered the world's southernmost site of early human life, reported to be 40,000 years old. Michael Mansell of the Tasmanian Aboriginal Centre states, When the archaeological report came out it showed that (life there) had gone back longer than any other recorded place anywhere else in Tasmania, dating back to 40,000 years. There is also some evidence of occupation earlier than the 40,000 BP range. 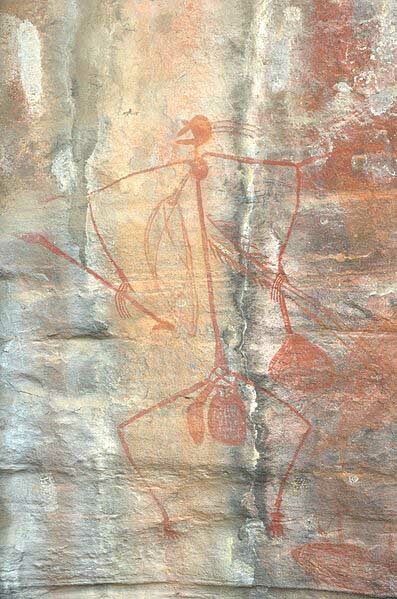 The oldest rock art found in Australia dates from between 45,000 to 65,000 BP. 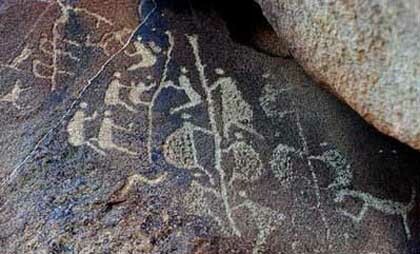 Rock art can take 2 forms: petroglyphs (rock engravings) and pictographs (rock paintings). 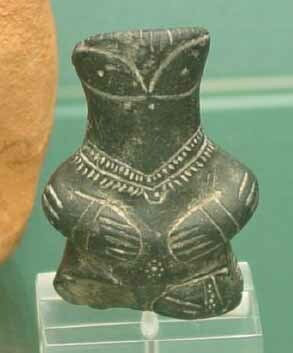 Did Ancient Astronauts Visit Australia? 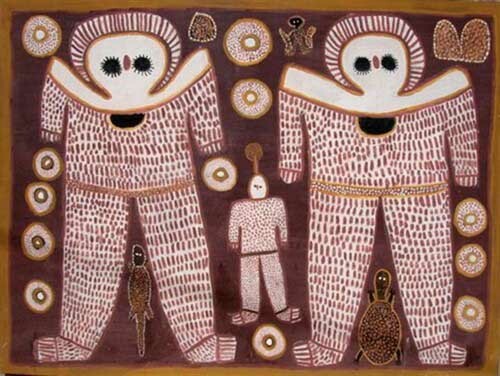 In Aboriginal mythology, the Wondjina (or Wandjina) were cloud and rain Gods who, during the Dream time, created or influenced the landscape and its inhabitants. When they found the place they would die, they painted their images on cave walls and entered a nearby waterhole. Today, certain Aboriginal people of the Mowanjum tribes repaint the images to ensure the continuity of the Wondjina's presence. Annual repainting in December or January also ensures the arrival of the monsoon rains, according to Mowanjum belief. Repainting has occurred so often that at one site the paint is over 40 layers deep. The painting style evolves during this process: the figures of recent years are stockier and some now possess eyelashes. The Wondjina paintings have common colors of black, red and yellow on a white background. 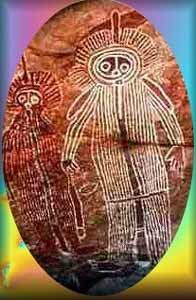 They appear alone or in groups, vertically or horizontally depending on the dimensions of the rock, and can be depicted with figures and objects like the Rainbow Serpent or yams. Common composition is with large upper bodies and heads that show eyes and nose, but typically no mouth. Two explanations have been given for this: they are so powerful they do not require speech and if they had mouths, the rain would never cease. 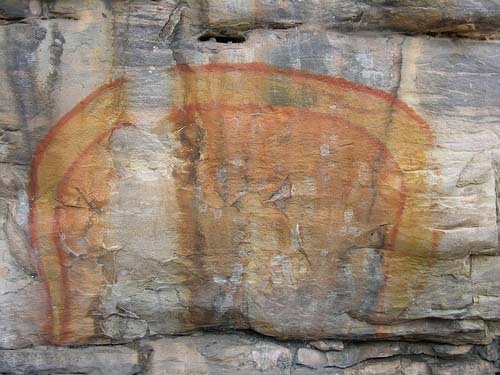 Around the heads of Wondjina are lines or blocks of color, depicting lightning, clouds or rain. The Wondjina can punish those who break the law with floods, lightning and cyclones. 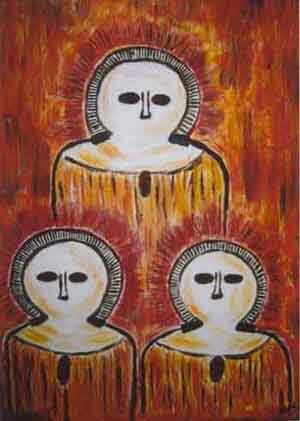 The paintings are still believed to possess these powers and therefore are to be approached and treated respectfully. Each site and painting has a name. 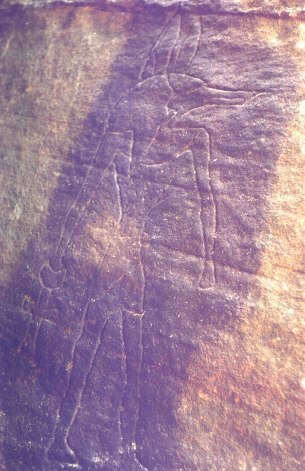 In 2007, graffiti depictions of Wandjina appeared in Perth, Western Australia. Styles ranged from stencil-work to a spray painted Wondjina driving a pink car. Using flickr and blogs, several people engaged in 'Wondjina watching', documenting the Wondjina graffiti they found. 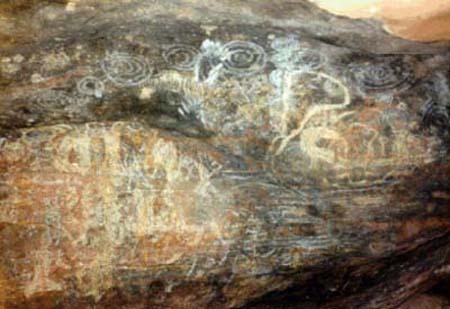 These 'wandering Wondjina' angered and upset Aboriginals who said that only certain of their people are permitted to depict the Wondjina. depicting Dreamtime myths dating back thousands of years. The Rainbow Serpent is a common motif in the art and mythology of Aboriginal Australia. It is named for the snake-like meandering of water across a landscape and the color spectrum caused when sunlight strikes water at an appropriate angle relative to the observer. The Rainbow Serpent is seen as the inhabitant of permanent waterholes and is in control of life's most precious resource, oils and waters. He is the sometimes unpredictable Rainbow Serpent, who vies with the ever-reliable Sun, that replenishes the stores of water, forming gullies and deep channels as he slithered across the landscape, allowing for the collection and distribution of water. Dreamtime stories tell of the great spirits and totems during creation, in animal and human form they moulded the barren and featureless earth. The Rainbow Serpent came from beneath the ground and created huge ridges, mountains and gorges as it pushed upward. The Rainbow Serpent is known as Ngalyod by the Gunwinggu and Borlung by the Miali. He is a serpent of immense proportions which inhabits deep permanent waterholes. Serpent stories vary according to environmental differences. Tribes of the monsoonal areas depict an epic interaction of the Sun, Serpent and wind in their Dreamtime stories, whereas tribes of the central desert experience less drastic seasonal shifts and their stories reflect this. It is known both as a benevolent protector of its people (the groups from the country around) and as a malevolent punisher of law breakers. The Rainbow Serpent's mythology is closely linked to land, water, life, social relationships and fertility. There are innumerable names and stories associated with the serpent, all of which communicate the significance and power of this being within Aboriginal traditions. The myth of the Rainbow Serpent is sometimes associated with Wonambi naracoortensis, a large snake of the now extinct megafauna of Australia. The Flinders Ranges is South Australia's largest mountain range which starts approximately 200 km north of Adelaide. The discontinuous ranges stretch for over 430 km from Port Pirie to Lake Callabonna. 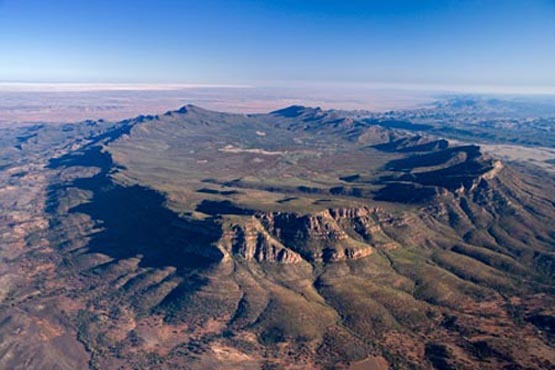 Its most characteristic landmark is Wilpena Pound, a large, sickle-shaped, natural amphitheatre covering nearly 80 square kilometres, containing the range's highest peak, St Mary Peak (1170m), and adjoining the Flinders Ranges National Park. The northern ranges host the Arkaroola wilderness sanctuary and the Vulkathunha-Gammon Ranges National Park. The southern part of the ranges are notable for the Pichi Richi scenic railway and Mount Remarkable National Park. Several small areas in the Flinders Ranges are protected as National Parks. 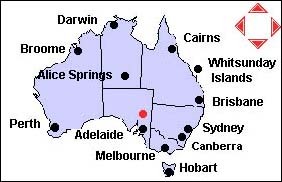 These include the Flinders Ranges National Park near Wilpena Pound and the Mount Remarkable National Park in the southern part of the ranges near Melrose. The Arkaroola Wilderness Sanctuary is a scenic protected area at the northern end of the ranges. In addition, the Dutchman's Stern Conservation Park, west of Quorn, and the Mount Brown Conservation Park, south of Quorn, are protected areas of the ranges. The Heysen Trail and Mawson Trail run for several hundred kilometres along the ranges providing scenic long distance routes for walkers, cyclists and horse-riders. Wilpena Pound is a natural amphitheatre of mountains located 429 kilometres north of Adelaide, South Australia, in the heart of the Flinders Ranges National Park. The Pound is the most northern point with access via a sealed road in this part of the Flinders Ranges. The closest town to the north is Blinman and to the south, Hawker. Attempts at farming the pound failed during the early 20th century. Following this the tourism potential was recognized in 1945. The Flinders Range contains some of the most unusual geological formations in Australia. Indications of gigantic electric arcs are unmistakable. 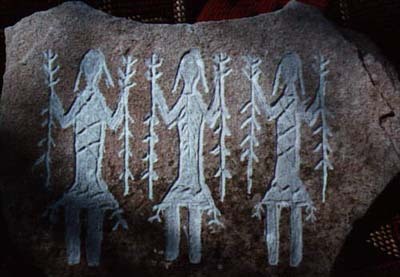 Carved in the mountainside are huge rock petroglyphs of eagle and Hawk-headed beings in canoes going down a river. 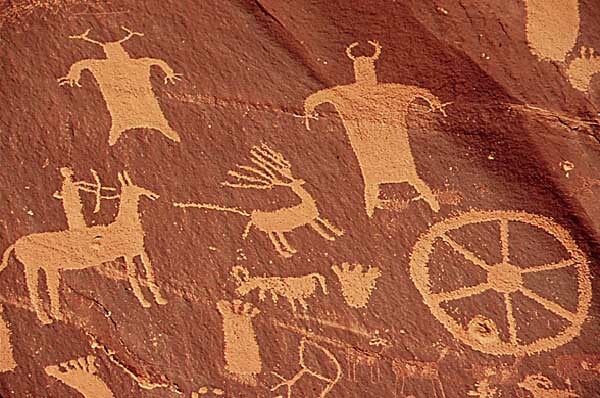 These petroglyphs allegedly date 40,000 to 60,000 years. The Aborigines who live in the area say that this is the 'site of creation'. There are pictures that match some of the crop circle formations and some of the ancient Egyptian hieroglyphs. 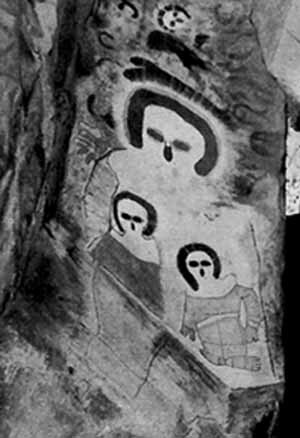 Interpretations of the petroglyphs is that they depict visitors from other worlds who came here in spaceships long ago, perhaps to seed the human race. May believe these visitors will return. 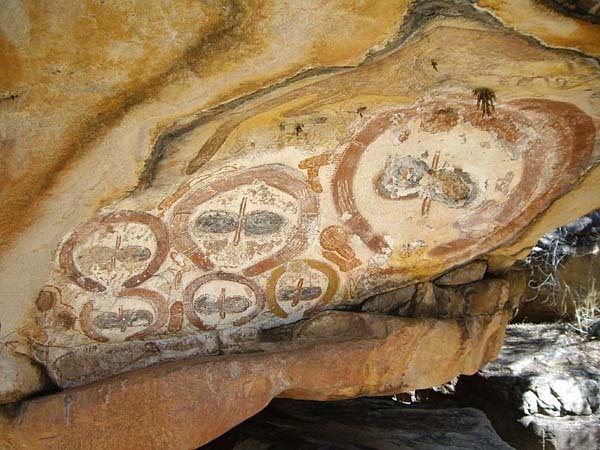 The Murujuga has the largest collection of rock art in the world. 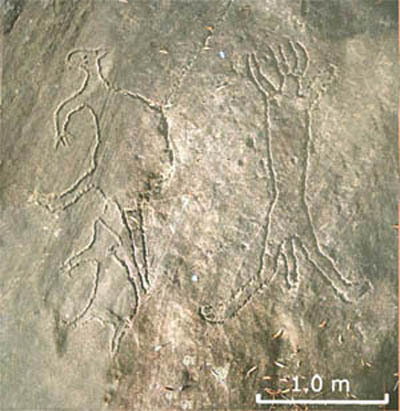 It includes Thylacine and petroglyphs, pictures of ancient animals. 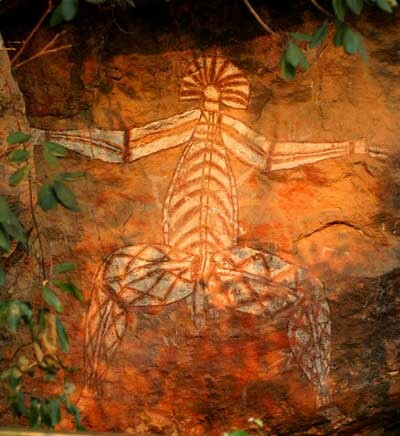 The Sydney Rock Art is unique in its own ways with beautiful carved figures of humans, symbolism and animals.